Picking up a new hobby often results in a learning curve, especially when it comes to learning the lingo surrounding the activity. Basketball is no different. 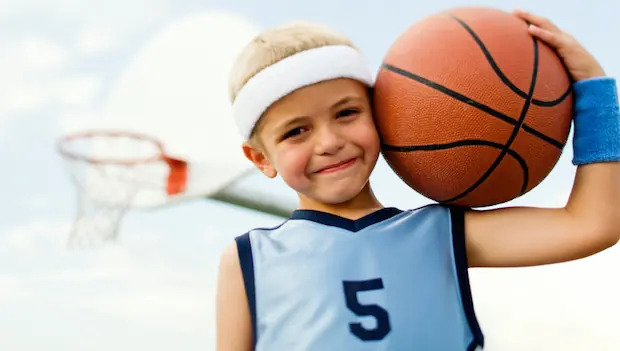 Before your child takes the court for the first time, make sure they're familiar with these basic terms all players should know. Airball: A shot at the basket that misses everything and doesn't touch the rim, backboard or net. Alley-Oop: When one player jumps and catches a pass from another player and simultaneously dunks the ball or shoots it in before landing. And One: When a player gets fouled while shooting and the ball goes in. The player then gets one free throw. Assist: A statistic that occurs when a player passes the ball to someone who scores after receiving the pass. The passing player earns an assist in the stat sheet. Backboard: The rectangular piece of wood or fiberglass the rim is attached to. Backdoor: An offensive action in which a player without the ball cuts behind a defender and toward the basket. Bank Shot: When a player shoots the ball and it bounces off the backboard and into the hoop. Block (action): A statistic that occurs when a defensive player stops an offensive player from making a shot by blocking the ball with his or her hand(s). Block (area of court): The area just outside of the key in which the rectangular blocks are painted. Also referred to as the post. Box Out: When a shot goes up, players use this technique, which involves widening their stance and arms and using their body as a barrier to get in better rebounding position. Carry: This penalty, which results in a turnover, occurs when a player holds the ball excessively at the apex while dribbling. Charge: This penalty, which results in a turnover, occurs when an offensive player with the ball runs into a stationary defensive player and knocks him or her over. Double Dribble: This penalty, which results in a turnover, occurs when a player dribbles the ball with both hands. It also occurs when a player dribbles, stops dribbling, and then begins to dribble again. Elbow: The area of the court where the free throw line meets the side of the key or paint. Fast Break: An offensive action where a team attempts to advance the ball and score as quickly as possible after a steal, blocked shot or rebound. Flop: When a player attempts to draw a foul on an opposing player by acting, fabricating or over-exaggerating the extent of contact. Free Throw: A free shot given to a player after a foul or a technical foul. The player shoots from the 15-foot free throw line while the rest of the players line up along the outside of the key. Key: The painted area that makes up the free throw lane. Also referred to as the paint. Lay-Up: A shot taken close to the hoop, usually when a player is moving toward the basket. Man-to-Man: A defensive strategy in which each player on the defensive team guards one person on the opposing team.